Come to Paraguay to make a difference in children's life. 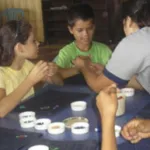 There are many kindergarten and nurseries for underprivileged children all over Paraguay, where volunteers can work in many activities and have close interaction with children. The organizations aim to provide the best possible care and at the same time help children develop themselves through games, help with school tasks and various educational activities. Some also provide morning and afternoon snacks. They welcome foreign volunteers to be part of their staff. Volunteer’s help always make the difference for these organizations and the children. Working experience or facilitating recreational activities with children is highly valued. Spanish is desirable to be able to communicate with children and help with homework, games and other activities. Spanish basic online lessons will be provided.